Nicknames "El Gabacho de Oro", "La Octava Maravilla del Mundo", "La Pura Riata"
One of two lucha libre sons of Texano, and the one who's most taken up his father's identity. Since the death of his father, he's frequently listed as (only) Texano, without the Junior. Actually got started as the masked Kempo Kid, before losing his mask to the orignal Stuka. He's been wrestling as Texano Jr. ever since, as a rudo on the indy scene and starting out as a tecnico in CMLL in mid 2003. Won the Mexican National Trios Championship as an oddball trio with Sagrado & Maximo, but CMLL didn't go anywhere with the team. Turned on his team and joined the rudos to end their championship reign. Fell in with the Perros del Mal from there, and stayed with the Hijos del Averno when other Perros left CMLL. Texano Jr.'s broke out from the pack in 2009. The upswing started by beating Maximo for his hair on March 15th. The two wrestlers seemed about on the same level, and the finish was an indication of how CMLL actually rated them. Texano Jr. continued his success in Guadalajara by defeating Atlantis to win the NWA World Light Heavyweight Championship in April. The title win gave Texano entry to the CMLL National Parajes Increíbles Tournament, where he was the surprise runner up to Ultimo Guerrero. Also, his partnership with Terrible became a steady union, the two forming a unit within the larger Hijos del Averno group. Terrible & Texano feuded with No Limit in the fall of 2009, leading to the Mexicans shaving the Japanese to end the year. Texano appears destined to be one of the top rudos in CMLL before too long. 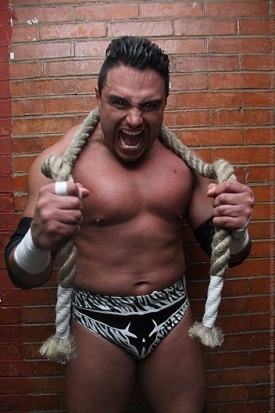 After jumping to AAA in 2011 he became a part of El Consejo stable. He would go on to make history by becoming the youngest & longest reigning AAA World Heavyweight Champion ever. This page was last edited on 26 March 2018, at 20:07.